Alchemilla Restaurant is located at the top of Derby Road in Nottingham and serves modern British food, with an emphasis on seasonal ingredients, in particular vegetables which are allowed to take centre stage on a modern and thoughtfully constructed menu. The menu changes depending on what is growing and available and what the team have foraged. Diners can choose from 10 or seven courses at dinner, plus an additional five course menu at lunch and from Tuesday to Thursday evenings. 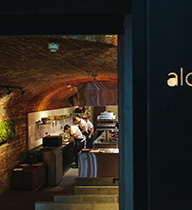 Alex Bond is head chef and owner of Alchemilla, which is the culmination of a long held dream to open his own restaurant after many years working with some of the country’s best Michelin starred chefs including Sat Bains, Phil Thompson at Auberge du Lac and Richard Turner at Turners in Birmingham. He has also recently been nominated in the National Restaurant Awards ‘chef to watch’ category. Alchemilla sits within a former Victorian coach house (which had sat unused for over a century) and has been transformed into a modern restaurant space. A brushed aluminium kitchen sits within the exposed brickwork of the original coach house arches, which have been given a new lease of life by the addition of huge skylights. The Alchemilla theme runs from the living wall alongside the front door, where the planting gives diners a taste of what is to come. The living theme continues inside where a moss wall blurs the boundaries between inside and out and a feature bookcase at the chef’s table hints at some of the many inspiration sources behind Alex’s vision. Jars of foraged sweet woodruff and elderflower sit alongside Nordic cookery books and plants. As a keen gardener Alex is a firm believer that 99% of his ingredients should be British sourced.